Empire/Other is currently a work in progress. The resulting exhibition of animated digital videos and presentation of fractured ceramic objects will present to the public a new way of looking at how traditional objects carry forward their cultural histories and can also be mutated to speak of hidden histories. 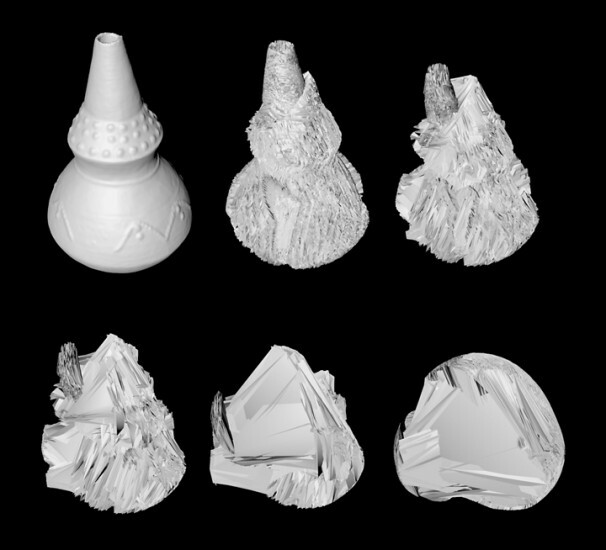 I am working with digital 3-D modeling and scanning technologies, 3-D printing, and ceramic processes to produce hybrid objects that comment on the frictions and complexities generated by historical empire, colonialism, and their resulting trade routes. By collaborating with museums that have significant holdings of colonial-era ceramics (American, British Empire period, African, Asian, etc), I am digitally scanning portions of their collection in order to forcibly composite new hybrid forms that speak of historical conflict. The first tests have been done on Belgian Art Nouveau objects and Congolese ceramics dating from the early 20th Century and were produced during the colonial era. We have scanned approximately sixteen objects and are in the process of pairing them to digitally force them to try to "become" like the other (one each of Belgian and Congolese). Because of the nature of the mathematical algorithm of the 3D software, it is a physical impossibility and the shapes shift and fracture, creating shattered iceberg-like hybrids that never meet in the middle--perhaps a fitting metaphor for the clash of cultures and histories. These will then be 3D printed and rendered as ceramic objects.